Two years after an earthquake shook Haiti, the small country grappled with the death, the destruction and the debris. After the earthquake on January 12, another health crisis struck about 10 months later: cholera. The bacterial disease brings about a painful death, as quickly as within two to three hours, because of the amount of fluid and electrolytes that are lost. Symptoms are watery diarrhea, dehydration, nausea and vomiting. Cholera spreads through contaminated water. While it has largely been eradicated in the West, it has been known to come back during war or natural disasters when people are forced to live in crowded places without proper sanitation and clean water. 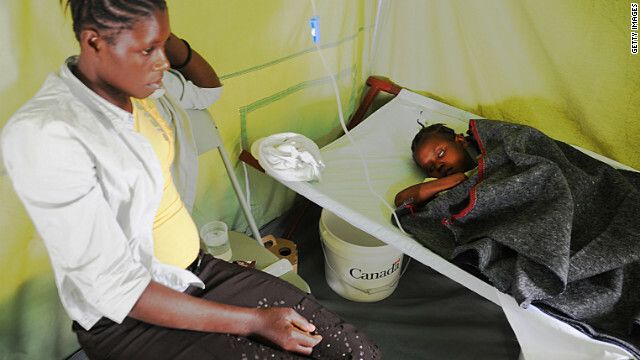 So far, cholera has killed 7,000 people and infected 520,000 people, according to the Pan American Health Organization. Medical workers continue to encounter about 200 new cases everyday, said Dr. Jon Andrus, deputy director of PAHO, which is part of the World Health Organization. In an article published in the American Journal of Tropical Medicine Monday, the authors identified who they believe to be the first to get cholera in Haiti after the earthquake. An 28-year-old man with mental illness from the town of Mirebalais was suffering from hallucinations, disorganized thoughts and paranoia, according to the article written by Dr. Louise Ivers and Dr. David Walton from Harvard Medical School and Partners in Health. The man was known to wander through town naked, and drank from and bathed in the in the Latem River. He fell ill with watery diarrhea and within a day of showing symptoms, the man died. The two people who prepared the body for his funeral also developed watery diarrhea. There is no lab method to confirm that this was the first patient to start the epidemic, wrote the authors. “This patient’s case is the first in the community’s collective memory to have had symptoms that are recognizable, in retrospect, to be those of cholera,” according to the study released Monday. The patient had an underlying mental health condition that led him to drink from the river and this contributed to his illness, the authors concluded. The cholera epidemic has continued to spread even until today. The infection spread to the neighboring Dominican Republic, and individual cases were exported to the United States, such as Boston and Miami. By sequencing the genome of the cholera strain, researchers found that it was nearly identical to strains circulating in South Asia, according to a study published online in the New England Journal of Medicine last year. The best way to prevent cholera is to get clean water and better sanitation. Treatment for the disease is immediately necessary through rehydration, intravenous fluids, antibiotics and zinc supplements. « Previous entryCould a nicotine patch slow dementia? I AM not trying to offend anyone, however, I consider disease to be mother nature's idea of population control. Pity, mother nature does not seem to have a solution for supratentorial cholera. I AM not trying to offend anyone, however, I consider death by natural causes and disease to be mother nature's idea of population control. I hope mother nature finds a solution for you. In response to the comment it's Mother Nature's way of population control: That is one of the most racist statements I've heard. Cholera is a disease like malaria, smallpox or any other highly contagious diseases. There have even been cases in the USA, but so minor the group affected from eating contaminated shellfish or drinking water. How is that a racist comment? Sorry forgot the rest. It was such a small group affected it wasn't news worthy. Only those of us tracking CDC bulletins were aware of it. Linda Life is a school , we learn everyday, therefore listen to jujubee the Cholera in Haiti is defenitely a Human disease control. for being free from their slavery era, One day things will look UP for them once more. Lol, Haitians. The best thing that we could do for them is leave them alone. Let nature take its natural course. Relictus...you call it "nature" when human actions were the direct cause, according to the report.I wonder if a situation arose where someone were to infect you with an AIDS contaminated needle if you would be content with the rest of the community, including the medical portion, taking your barbaric, even idiotic, approach of "let 'nature' take it's course." I see ignorance in this world has yet to cease being popular. God will judge us all. But for those who are ignorant and evil, I'll pray for you. If we want them out no Nation on earth can oppose , we'd just just do it . This really is a smart blog. I mean it. You really have a lot information about this matter, and much interest. You likewise find out how to make people totally behind it, obviously in the feedback. You have a layout here thats not much too fancy, and yet generates a statement as big as so what youre suggesting. Good job, absolutely.